We’ve been having a heat wave in Vancouver for the last couple of weeks and I’m starting to miss my cool wet coast rain. Summers here are my kind of perfect – sunny, but rarely so hot that you feel there’s nothing else to do but lay around inside, soaking up the air conditioning. I can’t believe it’s barely June and I’ve already near killed the pug on our usual hike through the trails out at UBC forest! He found a mud hole (that used to be water), laid down & called it a day. He had the right idea actually…just like a spa treatment! Minus the flies, of course. 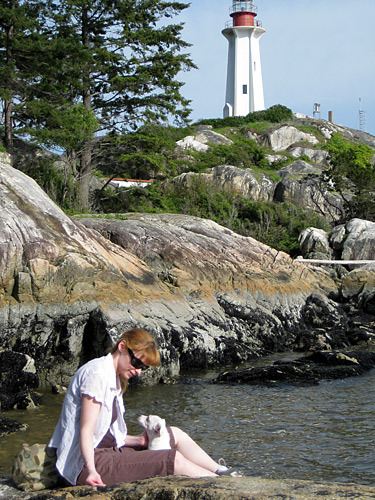 One of my favorite places to run the puppies is Lighthouse Park in West Vancouver. It’s a beautiful drive to get there and the whole park is off leash, so we have a great time exploring, getting a workout & then cooling off as we beachcomb along the rocks. 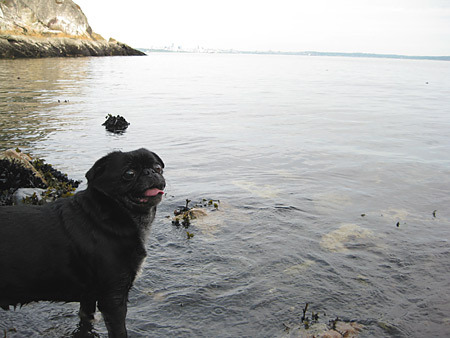 The pug loves to dig at all the rocks & though he won’t actually swim, he is getting braver & braver, going in right up to his chest. 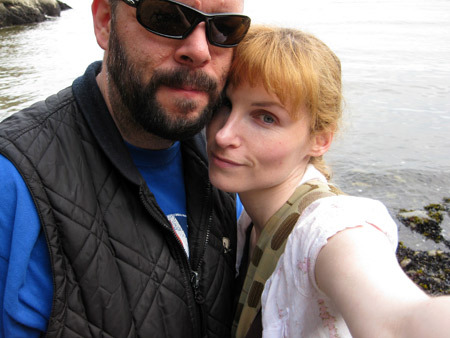 The mister and I like to crawl over the rocks, looking in the little tide pools for anything that moves. Tiny fish, snails and little crabs are common, but we’re always hoping to find that one unexpected thing we’ve never seen before. 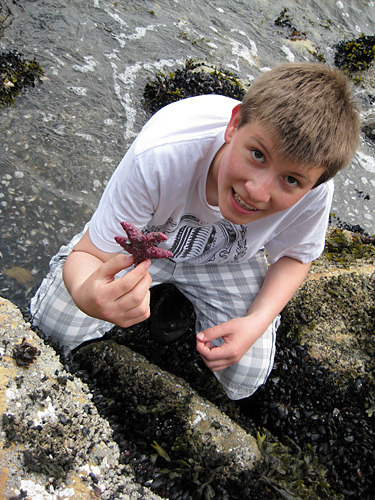 I hit the jackpot last summer when my mom was out to visit and we stumbled on piles of the most incredibly vibrant purple starfish AND a small octopus hiding under a rock ledge! Though I tried not to gloat since my mister had to miss it, it was awesome! We’ve gone back several times now, always hoping to catch a glimpse of the starfish or a little octopus again with zero luck until…ta da! Previous postMy Group Show is Up! Y’all make one good lookin’ lil family.